NEWTOWN, Conn.–(BUSINESS WIRE)– Advancing its soaring year-over-year digital advertising growth, Fine Cooking, the most trusted epicurean media platform for avid home cooks, launches a redesigned website, finecooking.com, to feature even more of its high-quality content and offer the ultimate user-friendly experience with improved navigation and functionality. 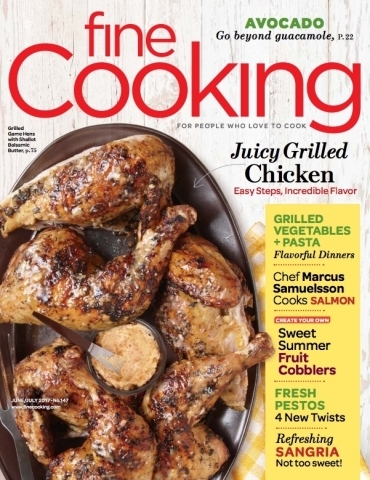 In addition to a 92% upsurge year-over-year in digital advertising revenue, Fine Cooking continues to achieve positive gains in print advertising, with two straight years as the #1 magazine in America in percent ad page growth, according to PIB. With a streamlined yet more indulgent design, the enhanced finecooking.com site translates the rich aesthetics of Fine Cooking magazine to a modern, user-friendly online experience. Upgrades include a faster site, advanced search tools, and an extremely intuitive layout and navigation. The new finecooking.com also offers added benefits to magazine subscribers with access to the online archive of back issues from 22 years; special issues; full episodes of all seasons of the critically-acclaimed PBS TV show Moveable Feast with Fine Cooking; Fine Cooking’s Essential Cookbook Collection; and Make It Tonight, weekly meal plans delivered right to their inbox. Fine Cooking’s advertising growth is not limited to its print and digital properties. Gains are posted across the entire platform through its development of highly customized integrated marketing programs that combine traditional print and digital elements, with branded content development and social media activation. This concentrated, cross platform delivery of engaged, passionate food and cooking enthusiasts continues to attract new advertisers across both endemic and non-endemic categories, such as Le Creuset, Wolf-Sub Zero, E & J Gallo, Tito’s Vodka, Celebrity Cruises, Cadillac, and more. Alliance for Audited Media (AAM) statements rank Fine Cooking #1 in the category in both newsstand pricing, at $6.95 per copy, and total copies sold per issue on the newsstand – far outselling Bon Appetit, Food & Wine and Saveur. The average annualized subscription price of over $27 results in a per-issue price of $4.54, three times that of Bon Appetit and Food & Wine, double that of Saveur. Moveable Feast with Fine Cooking, the 13 half-hour episode PBS series, will enter its fifth season with an estimated viewership of nearly 1.8 million and a national carriage rate of over 95%. The award-winning TV series will go international, filming in Italy and France, with current host Pete Evans for half the season and top chef Curtis Stone to host the domestic episodes to round out the full season. The Emmy-nominated series has attracted major funding partners that include Cadillac, E & J Gallo, Celebrity Cruises, Wolf Gourmet, Colavita Olive Oil, and Source Atlantique, among others. Combining print and digital advertising with social media activation and Moveable Feast sponsorship elements such as TV spots and program-related digital products, Fine Cooking was just named as winner of the MPA’s IMAG Advertising Revenue Award. Fine Cooking is created for people who love to cook by people who love to cook. Since 1994, Fine Cooking magazine, published by Taunton Press, has been dedicated to being at the center of an ongoing conversation about cooking. Today, Fine Cooking is a fully-immersive multi-media platform where every interaction fuels the avid home cook’s passion, journey and creativity in the kitchen. From expert tips, step-by-step instructions, hands-on techniques and beautiful photos for each triple-tested recipe, Fine Cooking celebrates the pursuit of excellence, and the fun process of cooking to add inspiration to every meal. For more information, or to schedule an interview with an executive from Fine Cooking, please contact Tami McCarthy at Tami@tmgpr.com or 212.750.5755.